Making solar visible brings new value to the return on solar investments. We call this Return On Visibility. In this post, we explore how ROV works and quantify the impact with two scenarios. For the right properties -- like the mixed use development shown above -- visible solar can provide an amazing yield. I’ve always gravitated to work that makes a positive difference. A lot of people seem to feel this pull. I believe we’re wired to want to use our gifts in a way that brings benefit to the world and its people. So, I’m thrilled to announce that Spotlight Solar was named in the 2017 Best for the World list for B Corporations, recognized for being in the top 10% for environmental impact. From the get-go, Spotlight was conceived to be beneficial. We aspire to create positive impact—to increase the adoption of solar energy, to create dignifying work and to benefit our community. The primary way we go about this is to make beautiful solar structures that go in highly visible places. Making solar energy technology visible (and great-looking) raises awareness and acceptance of solar—leading to more people and companies choosing it. Social scientists call this the Neighbor Effect. And we love how our clients use our products to amplify their advocacy for clean energy. This positive intent is why we became a Certified B Corporation (B = Benefit), applying a rigorous set of standards developed by B Lab and embodied by a growing community of 2,000 like-minded companies. The B Corp standards keep the bar high for how we treat our employees, shareholders, suppliers, community and our interdependent world. B Corps like Spotlight are trying to be good stewards of their resources, to use business as a force for good. I’m writing this as I travel to the annual B Corp Champions Retreat. My intent is to learn from colleagues at the likes of Patagonia, Seventh Generation and Ben & Jerry’s to discover ways to increase the benefit that Spotlight Solar brings to the world. Your ideas are always welcome! The product rounds out the Spotlight product line with a design that offers the highest capacity and the widest canopy footprint (shade) of any of our products. It brings a new, stalwart aesthetic to our mix as well. Its lineage is found in the repurposing of old industrial sites into modern mixed-use developments. Often these re-developments have design and construction characteristics that are beautiful in an old-school function-before-form style. Trestle provides the most shade of any of Spotlight's products: over 300 square feet. And its human scale (14' tall) is perfect for creating outdoor spaces for seating, eating, and drinking in the shade of beautiful solar technology. It incorporates 18 Lumos solar panels that look gorgeous from every angle, especially including the underside (where the people are). Its 4.5 kW capacity isn't going to run a big building, but it shows up: you could run electric vehicles for over 22,000 miles with the clean energy it puts out. If you want to talk light bulbs, how about 474 -- LED of course. Salt Lake City’s Tracy Aviary has long been a leader in education about the natural world, and a proponent of clean energy as part of conservation. They decided that their third solar installation should be uncommonly visible and compelling. So…put it right amongst visitors and birds at the most popular exhibit – the flamingo habitat! We are proud to announce the first installation of our new product, Industry. Wake Electric, a coop utility in Wake Forest, saw fit to incorporate three Industry structures at their new headquarters in Wake Forest, NC. This is close to our office, so we were able to be on-site for the installation work by our partner PowerSecure, and the subsequent grand opening of the new building. they incorporated a rooftop solar system, building efficiency measures, and LED lighting to make the building net zero – it makes more energy than it uses. But the many people who drive by every day couldn’t tell it was a green building, and might have missed the “solar” in their name. Not any more. Tor Valenza has been a primary solar industry voice for years, and can be found under the @SolarFred handle and UnThink Solar, his marketing services firm. He recently saw fit to write about Spotlight Solar’s approach to making solar visible…and beautiful (OK, that word we added). As he says, he doesn’t normally write about products. But I’m making the exception this week for Spotlight Solar. Spotlight’s not a typical BIPV solution, but a working aesthetic solar structure that’s also a green PR solution that calls attention to hidden solar. We really appreciate Tor’s analysis, partially because he’s an influential solar advocate, and especially because he’s a marketer. He recognizes the value-add we’re striving to bring to clients and the industry. their products are meant to be a complementary added value, calling attention to the real solar solution — rooftop or ground-mount panels that are out of site or difficult to see. Alternatively, they could also be calling attention to other invisible sustainability efforts by the building’s architect, such as the St Louis Rams’ green initiatives. Another example for its use are the many renovated buildings today that have achieved LEED Platinum status, but beyond the press release, a LEED medallion, or perhaps a small lobby display, the general public might walk on by and never realize that there are solar panels on the roof or that the structure was built with ultra high-efficiency windows, reclaimed wood, and 100% LED lighting. From the outside, it looks like a normal renovated building. With a Spotlight tower, the same building’s visitors and tenants know their building is green from two blocks away. As a result, Spotlight is part art, part landmark, and part green architecture, and of course, all solar. This will sound a little self-satisfied, but I’m really pumped that Tor gets it. The solar industry is filled with accomplished people who have made essential strides in technology, cost, policy, and financial mechanisms to facilitate investment. It is not, however, filled with investors in marketing – an equally essential element in building a healthy industry. Tor’s is a lonely voice, calling for practical marketing efforts to help more people recognize the appeal of solar energy. 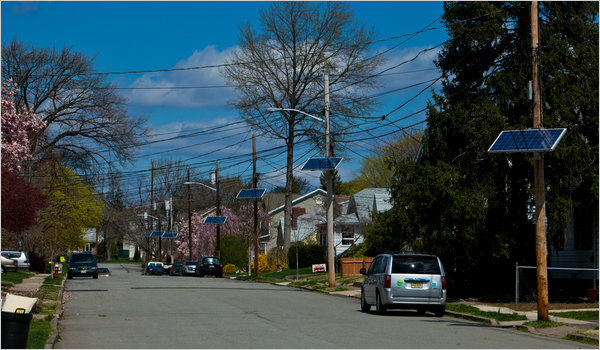 Spotlight Solar’s part is to physically make solar more appealing and visible. It is marketing-as-product. Tor Valenza, a.k.a. Solar Fred of UnThink Solar posted today on Renewable Energy World about Spotlight, and included mention of a new product we’ve been working on. So, I guess we’d better let Flora out of the lab. We’d love to hear what you think. This product concept arose through listening. Microgrid Solar, which recently installed our Lift product for the St. Louis Rams, suggested we create something flower-ish, based on napkin drawings they’ve done in collaboration with progressive clients. Microgrid really gets aesthetic solar. So we started talking to other integrators, property owners, and architects while we iterated on an idea. We were able to borrow some elements of Lift which customers have really liked, and have gotten a lot of positive feedback. Below are some renderings of what it might look like around the Chapel Hill and Raleigh area. Of course, we wanted to make something aesthetically appealing, but also ensure that it looks purposeful. We try to make beautiful machines which will make a compelling clean energy statement. In this case, we wanted to reference natural forms (flowers) without making a literal copy of a flower. We also wanted to try something smaller than Lift (which is 22’ tall, 24’ wide, and has a power capacity of 3kW). Flora (so far) 16’ tall, 11’ wide, and 1.5kW – about half the size (and price) of Lift. And we wanted to create something that could be installed in groups. And as usual, we want to make our products flexible, so they can be customized and accessorized. Of course, it’s available in your favorite color combination. It also has two axes of tilt adjustment, and options for seating, power outlets, lighting, and communication displays. As those items get detailed out, we’ll share them. And we’d love your ideas! Please comment. How we did it: We listened. We went to our customers’ sites for several installations, photographed every moment, and discussed with our installer partners what could be better. We listened to this guy, Andy Stough. He’s engineered rockets, bulldozers, and innovative wind generators. He made a two-way joint for Lift’s solar arrays that moves* like butter, and locks against 140 MPH winds, in an wonderfully simple way. He used a 3D printer to try out the details, and a rare laser shaping machine for production. We borrowed lessons from my work on other architectural products. Balancing beauty, ease of assembly, flexibility, and function is tough, but it’s what makes a great product. Spotlight products act like Legos, designed with standard parts which go together in different ways. And we listened to our design advisor, David Hill. He’s good. Lumos 250 watt solar modules. Elegantly simple, efficient, and beautiful from every angle – even the back. Don’t worry, it still comes in 200 colors. We’d love to hear your thoughts on these changes and other ideas you might have for Lift. Please comment. *No, the arrays don’t track the sun, but they can be oriented in any direction very easily. Last week, four shiny new Spotlight Solar structures were installed at an amazing new school in North Carolina. Sandy Grove Middle School is not just net-zero, it will make more energy than it uses. It has a 590kW solar system, a geothermal system, advanced efficiency, LED lighting throughout, and more. And it has four Spotlight Solar “Lift” structures in vibrant color right in front. When this school opens in August, it will benefit students, faculty, and parents. And it will lift expectations for the whole community. That’s something we’re proud to be part of. AND, because of its innovation in energy management and the public-private funding method, it will save the taxpayers $35 million. The architect and project developer, Firstfloor is the champion of this project (lead architect Kathryn Lynn, pictured). They, along with our integrator partner, PowerSecure Solar, chose Spotlight Solar to provide the cherry on top of this beyond-net-zero sundae. Not just to look great, but to connect the dots for students. Every morning when the busses unload, kids will walk right under beautiful solar machines, and know they are learning at one of the most future-savvy schools in the country. We couldn’t be happier with the result. More pictures here. We’ll update this story as the building and landscaping reaches completion this summer. Solar Today magazine recently ran a story about CenturyLink Field’s 782 kW solar system. The largest solar system in Washington, at a cost of over $3 million, this is a great example of the Seattle Seahawks organization’s care for their environmental impact. We greatly respect this. But we also regret that it is invisible! OK, not invisible to a few people on the parking deck, or in helicopters. But the 67,000 people in the stadium can’t see it on the roof of the event center next door. Vollis Simpson has become famous for his amazing whirligigs – whimsical constructions with myriad figures, shapes, and colors, all mechanically wind-powered. Now in his 90s, Mr. Simpson still actively builds and maintains his creations. But even for a man of his considerable capability, keeping up with 30+ large and aging clockwork machines/artworks is a bigger task. So the city of Wilson, NC has set out to create a whirligig park, to preserve and display these terrific creations, and celebrate in an enduring way Mr. Simpson’s accomplishments. Work has already begun, and I was privileged to see it in process. Some residents consider the overhanging panels “ugly” and “hideous” and worry aloud about the effect on property values. We agree with Mr. Olsen. Utility poles and wires are already bad enough, but get worse when you stick a rectangle on the side. Here again is a reason for Spotlight Solar. Solar has a place in meeting global energy requirements, but needs to be an aesthetic asset, not a liability. Spotlight Solar had an opportunity yesterday to contribute ideas on Winning The Future. The Obama administration has deployed agency leaders to 100+ sites to collect input from business on how the government can act to foster growth and innovation. We were honored to be invited; my thanks to Henry McKoy, Assistant Secretary of Commerce for NC for the invitation, and to the host, Ron Sims, Deputy Secretary of HUD. Our suggestion is to couple education initiatives (training a team) with market development (creating a playing field). Government support for the development of new markets is important in renewable energy, since regulation of energy prevents free market forces from functioning efficiently. We need to create favorable conditions for new, promising sources (e.g., solar) for three reasons: 1) the merits of clean energy which use free/renewable inputs are compelling; 2) the early stage of these sources prevent them from competing on cost (yet) with mature but problematic sources; and 3) clean energy/tech is a huge growth opportunity wherein the US lags. To be clear, we do not favor long term subsidization of solar, or any other energy source. Over time, different viable energy sources should be allowed to compete based on their true costs and merits (total costs, including environmental impact). But some things need help to get started, especially in sectors like energy where the “market” is highly regulated. Solar needs help to get started. It is already a $6B industry in the US, but makes up a fraction of 1% of generation, and is still 1/8th of the market in Germany, where policy has provided a solid foundation (and a known phase-out of subsidies). And some things have outgrown a need to be subsidized (e.g., coal). See Blair Kendall’s blog post on this. We’d like to see more investment in building demand for renewable energy. People hold very positive attitudes (a recent study by Elon University in NC found 84% of people in NC supportive of solar), but have limited understanding, low mind-share, and low consideration rates. We need to bring solar to people’s attention. I call it marketing, the government calls it public education. Either way, if we can bring solar to more people’s attention, it can stand on its own feet. This is why we create visible and attractive solar structures.